As a result of studying the Wilting Manor site for several years in the lower port area, I was led to the conclusion that there may be a second fortification on the top of the hill, where the manor house now stands. In particular the visual evidence of a second fortification in the Bayeux Tapestry and the connection of the main landing area by the strangely named Cow Lane justified further examination. The top field at Wilting, on the very summit of the land where the manor house now stands, is called Chapel Field and is 4.52 acres. The view from this site is astounding since there is a clear view over much of East Sussex to the west as far as Beachy Head and gives a commander occupying this site forewarning of any impending attack. To the north there is also a clear view of Telham Hill, where the London Road crosses the ridge, thus alerting any watch of troops arriving from London, whilst giving the defenders at least half an hour’s warning, in a day when half an hour could mean the difference between life and death. There is a geological fault line that marks the boundary of Chapel Wood, as it passes into Chapel Field. This means that it is likely that at the time of the Conquest the northern end of Chapel Field was a cliff, along most of the northern boundary making access through the wood impossible, except via the old road. This can be seen from the evidence inside Chapel Wood, where the old road appears to have originally passed directly into the wood and up through the centre into Chapel Field. The evidence for this is the existence of a large earthen ramp leading from the bottom road up through the centre of the cliff area where the fault line is located. To the left and right of this ramp there are also earthen terraces cut into the hillside, which are now completely overgrown with trees and very dilapidated. However enough remains for verification that this structure did not get there by accident. It suggests that a huge amount of earth has been moved at some stage in the past. I could not hazard a guess at what time period, but leave this to persons more qualified than myself. It can also be seen that the road later followed a route, more synchronous with the existing route, but further towards the centre of the wood. This is marked as a dotted line on the plan on the previous page. There are distinct track marks along most of this route, together with heavy ruts along the section below the cliff. This is evidently a more recent route, because of it’s ease of identification and lack of degradation. It could be assumed to be the route used prior to the modern tarmac road. The question this raises is “are the earthworks connected to the Norman Invasion?” I believe it is probable that the answer is yes and no. The Carmen reports that they reinstated the forts (in the plural) that were there. It is most likely that this referred to Iron Age defences simply because the Saxon developments were unlikely to be in need of reinstatement. It is also unlikely that the Normans, no matter how inventive, could have moved the amount of earth required in the short time that they were in England. However I am certain that these defences played a part in the Invasion plan since strategically it would be impossible, from a military point of view, to occupy the lower fort and not occupy a similar one on the high ground overlooking the site. Running through the centre of Chapel Field, just above the sign for the name on the photograph on the previous page, is a grey line running approximately east/west. This is a huge earthen rampart. 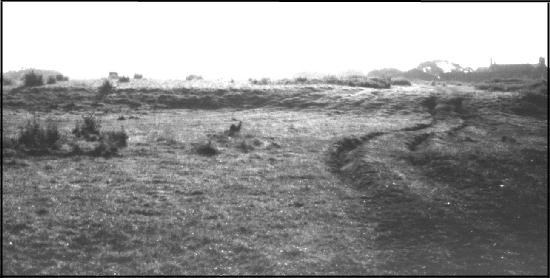 This is marked on the HAARG map in their 1987 report (143) as a lynchet separating Chapel Field from the top half (which was titled in the report House Meadow). The Oxford English Dictionary refers to a lynchet as a derivative of Linchet - A strip of green land between two pieces of ploughed land or a slope or terrace along the face of a chalk down. 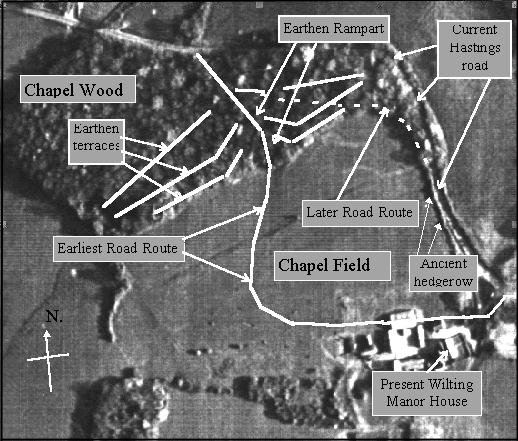 I believe that the earthworks in Chapel Field are man made and most likely to be of Norman origin. 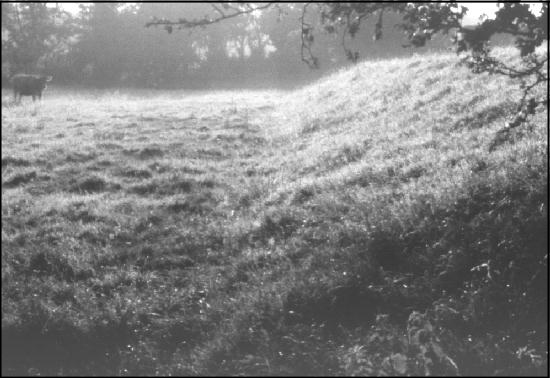 The lynchet is in fact the defensive front line of the fort, which the Normans installed at the top of this hill. There are clear signs that the field has been levelled into a rectangular shape. This is not something that can happen in nature and is also unlikely to relate to ancient defences. The Bayeux Tapestry shows a straight fronted fort with two towers at the top of the hill above the Norman camp at the port. I believe this earthworks marks the spot and traditional archaeological methods can verify this from post hole evidence, which should remain. It can be seen from the picture that this is a regular feature which ensures any attacker would be put at a severe disadvantage. Firstly the defensive wall would be located at the top of the rampart and secondly the open ground in front was accessed up a rampart with cliffs on either side, leaving nowhere to retreat in the event of failure in an attack. View of western end of rampart looking east with Manor House in right hand corner. The southern side of this structure is now obscured in the hedgeline, which runs back towards the Manor House site, with the eastern section almost completely obliterated by the gas substation which has been built there.